In our youth we are strong and healthy and then we weaken and die -- that's probably how most would describe what aging is all about. But, in nature, the phenomenon of aging shows an unexpected diversity of patterns and is altogether rather strange, conclude researchers from The University of Southern Denmark. Not all species weaken and become more likely to die as they age. Some species get stronger and less likely to die with age, while others are not affected by age at all. Increasing weakness with age is not a law of nature. Researchers from the University of Southern Denmark have studied aging in 46 very different species including mammals, plants, fungi and algae, and they surprisingly find that there is a huge diversity in how different organisms age. Some become weaker with age -- this applies to e.g. humans, other mammals, and birds; others become stronger with age -- this applies to e.g. tortoises and certain trees, and others become neither weaker nor stronger -- this applies to e.g. 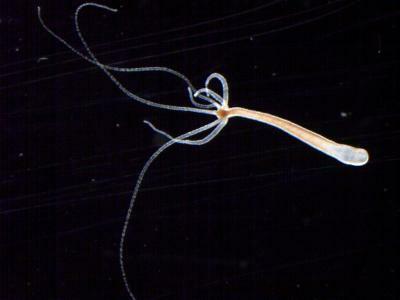 Hydra, a freshwater polyp. "Many people, including scientists, tend to think that aging is inevitable and occurs in all organisms on Earth as it does for humans: that every species becomes weaker with age and more likely to die. But that is not the case," says evolutionary biologist and assistant professor Owen Jones from the Max-Planck Odense Center at the University of Southern Denmark . "The diversity of mortality and fertility patterns in these organisms surprised us, and there is clearly a need for more research before we fully understand the evolutionary causes of aging and become better able to address problems of aging in humans," says Owen Jones. For several species mortality increases with age -- as expected by evolutionary scientists. This pattern is seen in most mammal species including humans and killer whales, but also in invertebrates like water fleas. However, other species experience a decrease in mortality as they age, and in some cases mortality drops all the way up to death. This applies to species like the desert tortoise (Gopherus agassizii) which experiences the highest mortality early on in life and a steadily declining mortality as it ages. Many plant species, e.g. the white mangrove tree (Avicennia marina) follow the same pattern. "Extrapolation from laboratory data show that even after 1400 years five per cent of a hydra population kept in these conditions would still be alive," says Owen Jones. "It makes no sense to consider aging to be based on how old a species can become. Instead, it is more interesting to define aging as being based on the shape of mortality trajectories: whether rates increase, decrease or remain constant with age," says Owen Jones.